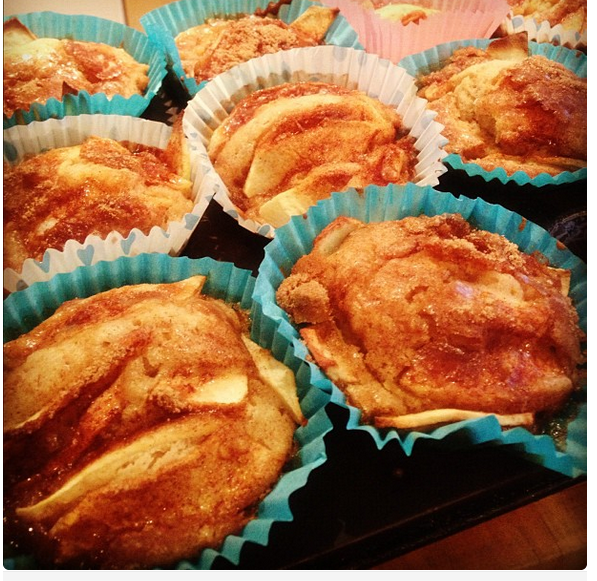 How To: Apple and Cinnamon Muffins! I have recently discovered cinnamon and am loving using it in recipes! I love mixing it in with my porridge and also sprinkling it on top of chopped apples! These muffins are so quick and easy to make as well as being delicious! 1. Preheat your oven to 200 C / Gas 6 and line cupcake/muffin tin with paper cases. 2. In a bowl, combine melted butter, sugar, beaten egg and milk. Sift in the flour, cinnamon and salt and stir until all are combined. The mixture should be lumpy, not smooth. 3. Spoon the mixture into the cases until about 2/3 full! Push the apple slices slightly into mixture. Mix the sugar and cinnamon and sprinkle over the muffins. 4. Bake in the preheated oven for 15-20 minutes, or until they go light brown. Wow, these sound so yummy!